Friends! 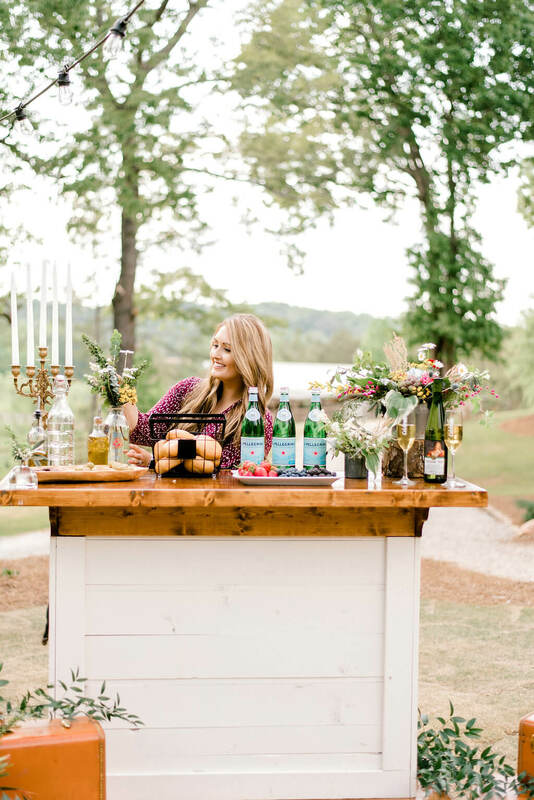 I’m so excited to finally be sharing this on the blog! 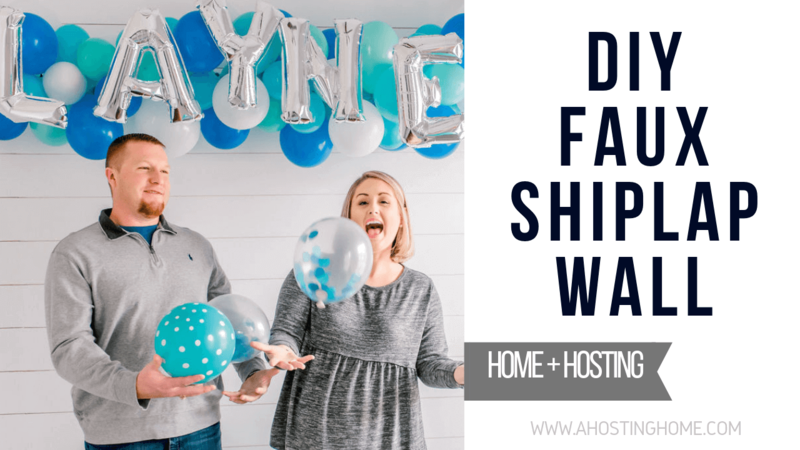 You may remember a while ago on Instagram Stories I shared how we were starting the clean-out of our guest room for Layne’s nursery and how we had plans for some upcoming projects. One of those projects was that I wanted to do a shiplap wall on the wall that would be behind the crib. 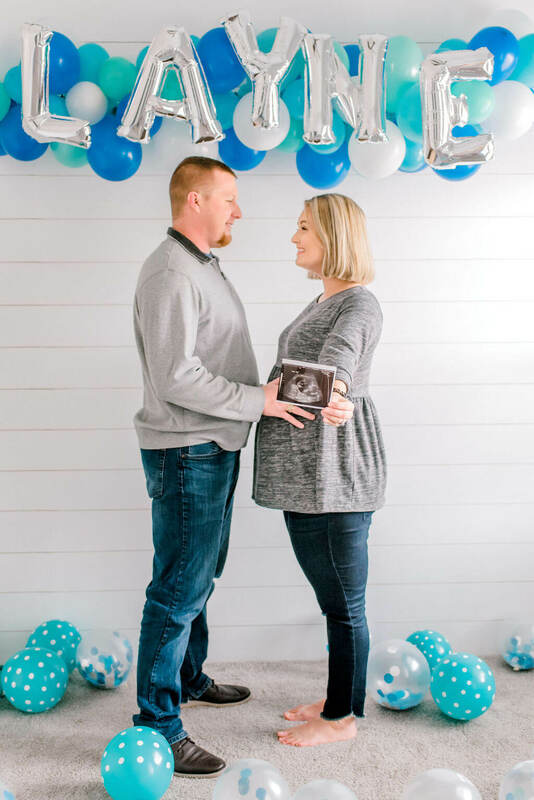 I planned to wait on sharing it until I did our nursery reveal in a couple months. However, I’ve gotten so many questions on how it turned out and how we did it. 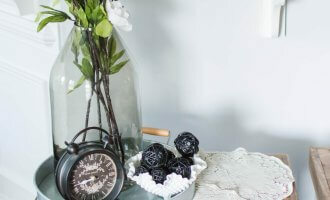 So, I decided to share a sneak peek and quick tutorial here on the blog! You’ll have to wait to see the rest of the nursery though. But, I promise it’s coming soon! 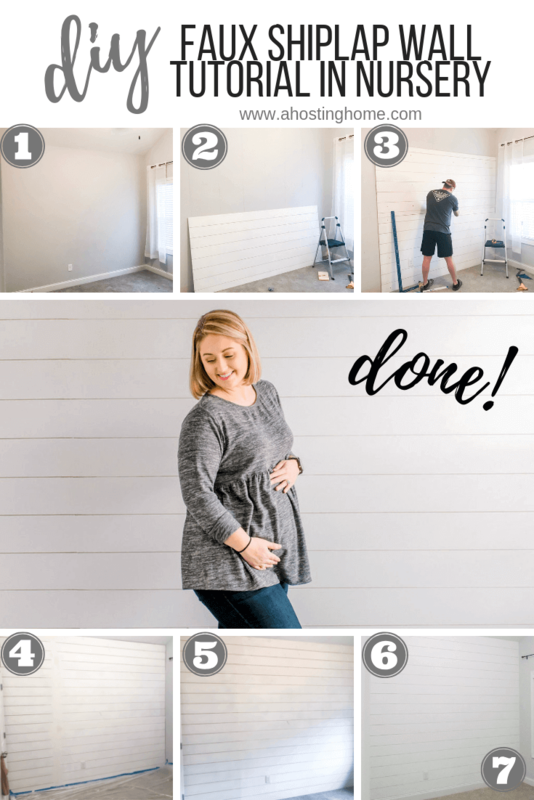 If you’re curious on how we did our faux shiplap wall in the nursery, here’s a little overview of how it all came together. You can also take a look at the ‘Nursery’ highlight on our Instagram Stories for a walk through of the process and how we made the cuts. Here’s a look at the wall in the nursery before we started. The room itself is relatively small, but it has vaulted ceilings. With my love of shiplap, I thought it’d be the perfect touch to add in some farmhouse charm make the crib the focal point of the room. We started off the process by removing the baseboard, of course. We did this because if we had left the baseboard on, the boards from the shiplap would have stuck out slightly past the baseboard and would’ve looked super awkward. Adding the baseboard back on was our last step when we were all finished. Meanwhile, we also started by planning out the wall by mapping out the studs on the wall. This is super important if you are doing a project like this because you want to make sure it’s safely and securely attached to the wall. The boards (or in our case, sheets) are heavy, and you want it attached to the structure of your home. If it’s secured only into the sheetrock rather than the wood studs, there’s a risk of it ripping / falling off the wall. Since this was in the baby’s nursery, we especially didn’t want to take that risk. 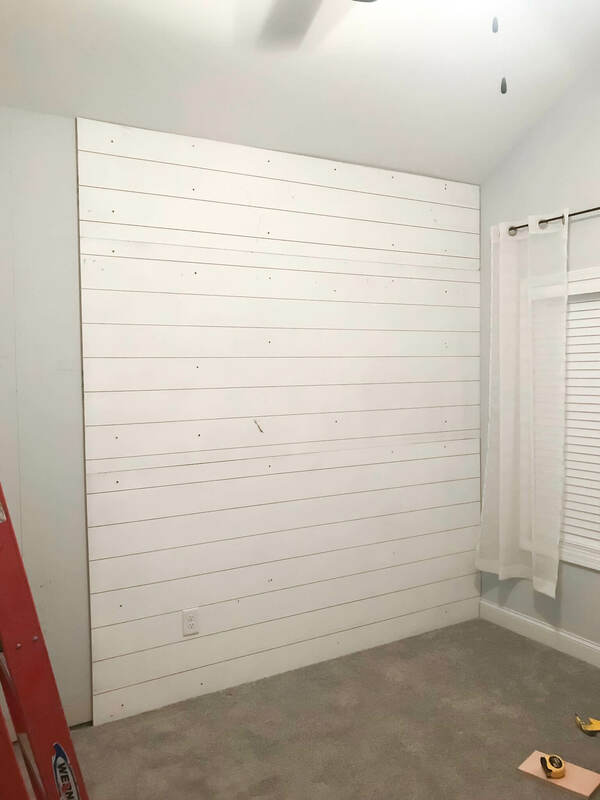 Our shiplap wall was constructed a little differently than you’d probably expect! This may even be different than any other tutorial you’ve seen before. 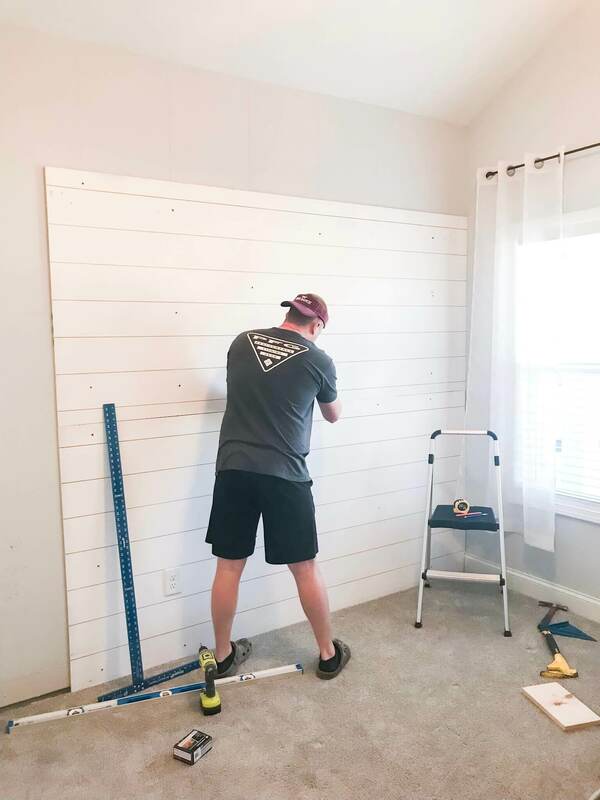 We actually did a faux shiplap wall out of 4′ x 8′ sheets of 3/8″ thick MDF with (approximately) 1/8″ cuts through the sheets 6″ apart to create the look of shiplap boards. We did this to save the time we would’ve spent on three things: running the sheets through to cut 6″ boards on the table saw, spacing the boards accurately and evenly each time while putting them up, and then leveling each time you’d go to add a board. When it came to doing the faux shiplap with the entire sheets of MDF, we’d just have to level the sheet itself as it went up. 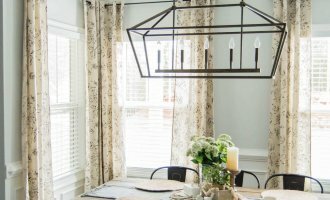 Rob and I have loved working with MDF on projects ever since we saw Holly and Brad using it so much for their projects over at Our Faux Farmhouse. MDF is relatively lightweight (compared to other plywood), priced pretty well, and doesn’t need any sanding or prep before being painted. It’s also really strong, and can stand up to some abuse that other woods can’t handle. Side Note: MDF comes in brown sheets, but we used leftover MDF sheets that we had painted white from sponsoring The Bridal Society’s annual conference’s backdrops in Orlando at the beginning of December. When it came to getting the MDF on the wall, we hung entire sheets one at a time. The sheets are pretty heavy (I’d say about 80 lbs per full sheet), but Rob and I were able to handle it ourselves. We were able to lift it up as a team and I’d hold it in place as he secured it to the studs. Since our wall was only about 11 or 12 feet wide, we only needed to hang 2 full-size MDF sheets. The rest we were able to cut and fit together like a puzzle piece. Cutting around and making a hole for the electrical outlet was also easier than you may think. Rob simply measured where it was on the wall and translated that measurement onto the bottom MDF piece. He cut it out using a dremel, and we pulled the outlet through the hole. He secured the outlet to the MDF and replaced the cover. Easy as Sunday morning! After we got all of the MDF up on the wall, we filled in the holes and the seams. Rob filled the holes from the screws with spackle you’d normally use to do drywall repair. He then joined the larger vertical seam using drywall tape with drywall spackle on top. After the spackle dried, Rob then sanded down the spackled holes and seams to prep for painting. He also took the dremel and matched the lines across the joined vertical seams to create the illusion of continuous horizontal shiplap boards. We finished the wall off by caulking around the edges of the MDF to seal / join it to the existing room walls. It took a few tubs of caulk to fill it in, but it turned out so well! It looks like it was an existing part of the house. 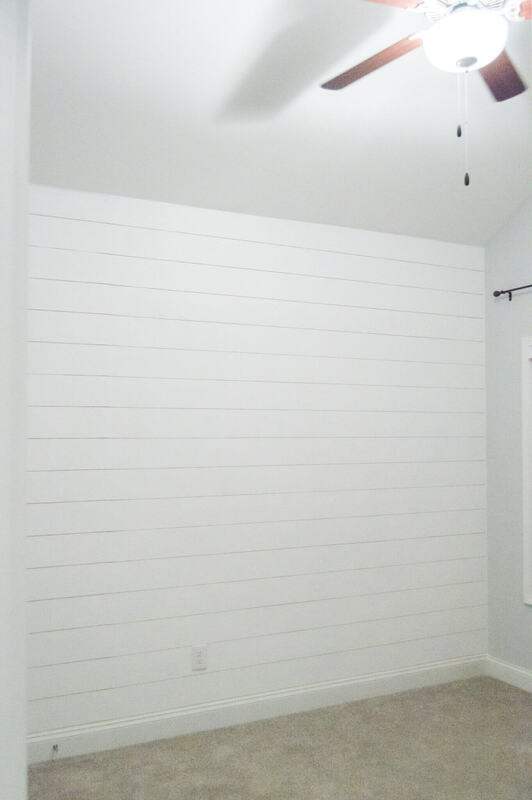 Lastly, we finished off the shiplap wall with a couple fresh coat of white paint! 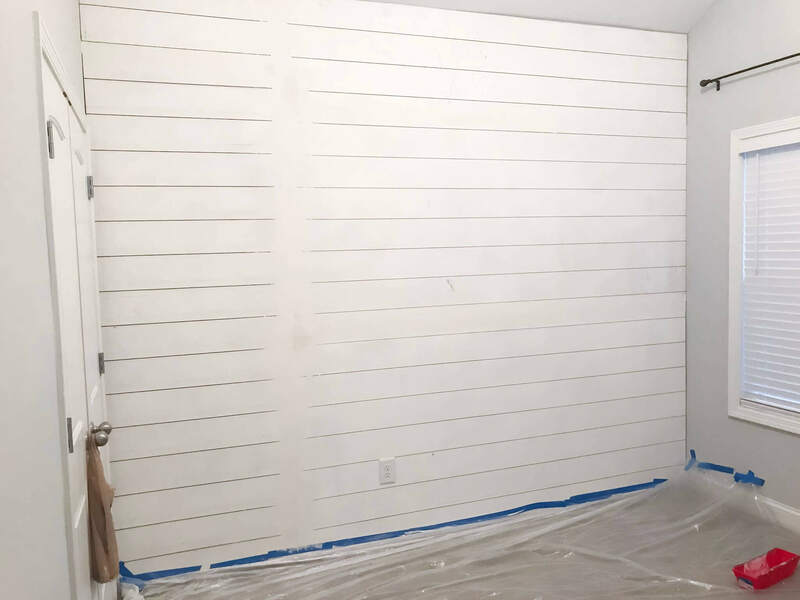 Side Note: One small tip when it comes to painting a faux shiplap wall is to make sure not to paint inside of the cuts. This will keep the illusion of the spacing / “shadow” in between the boards that comes with hanging shiplap. 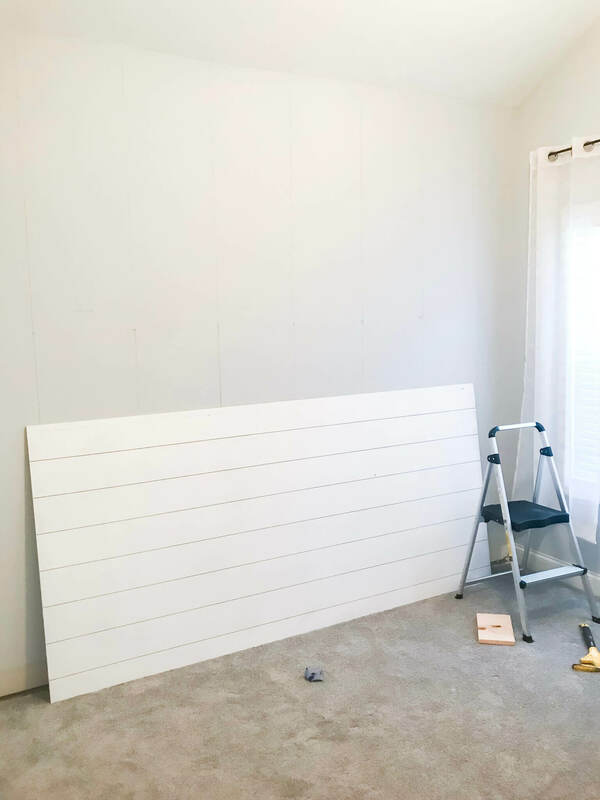 We are in LOVE with how the faux shiplap wall came together in Layne’s nursery. 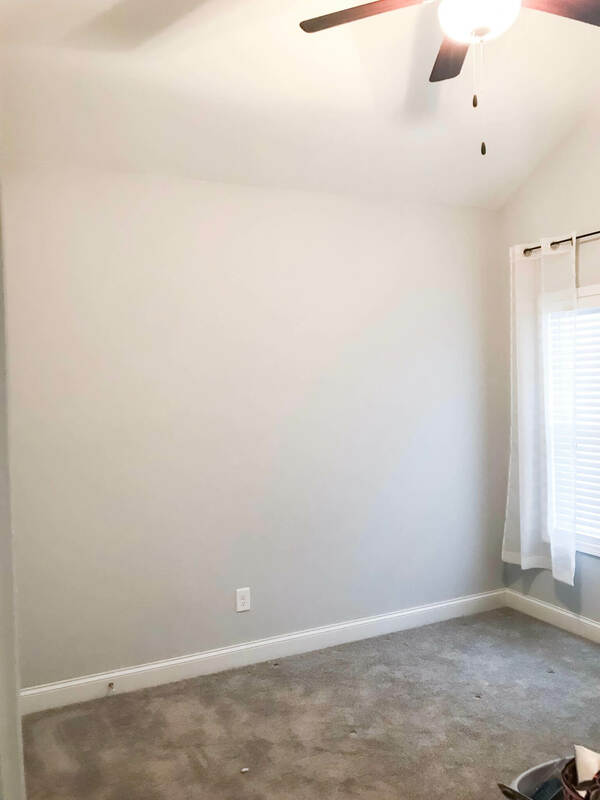 It makes the vaulted ceilings look even taller, and I’d like to think it actually makes the entire room look bigger as a whole as well. 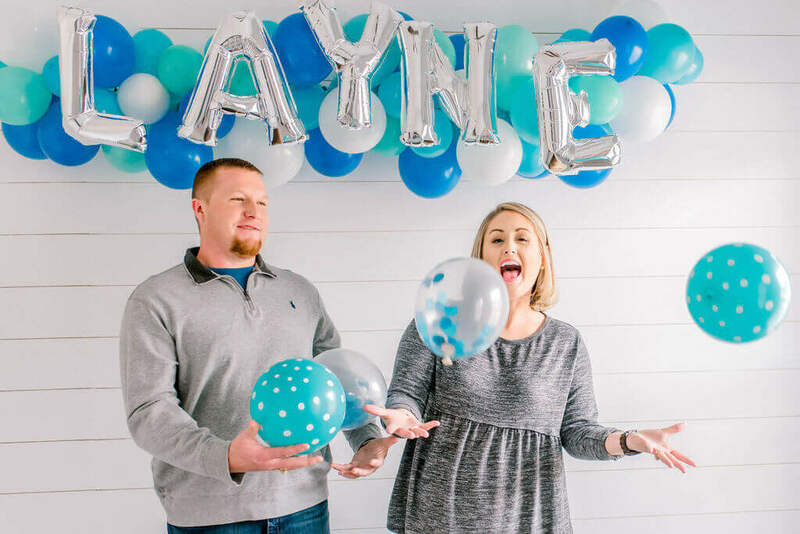 We can’t wait to get the rest of Layne’s furniture delivered and set up in his little room! It’s going to look so cute! Well, there you have it, friends! 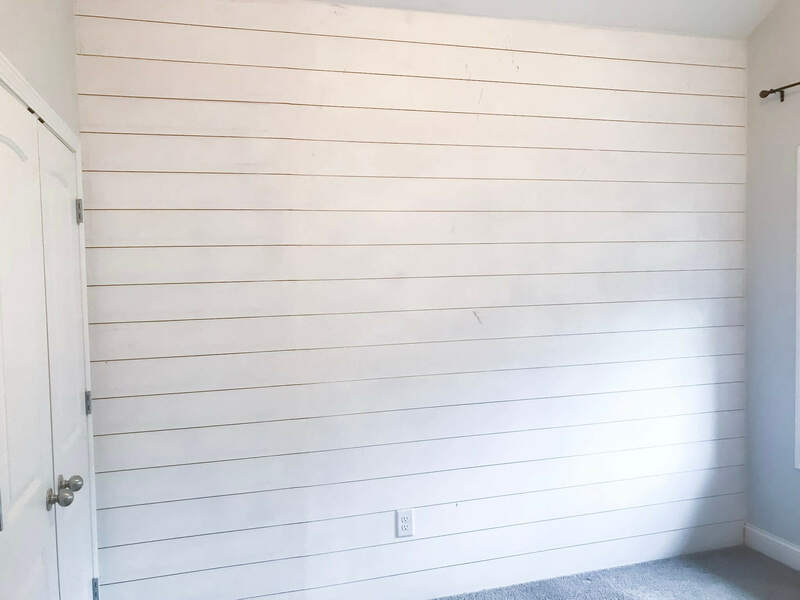 There’s a little sneak peek of the faux shiplap wall that we constructed for Layne’s nursery. 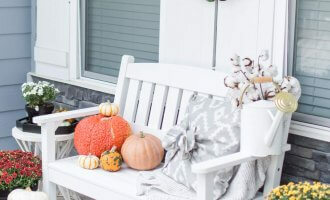 I hope this overview and tutorial helps you if you’re wanting to construct your own piece of shiplap heaven in your home. Rob and I can’t want to show you how the rest of the nursery comes together in the coming weeks. 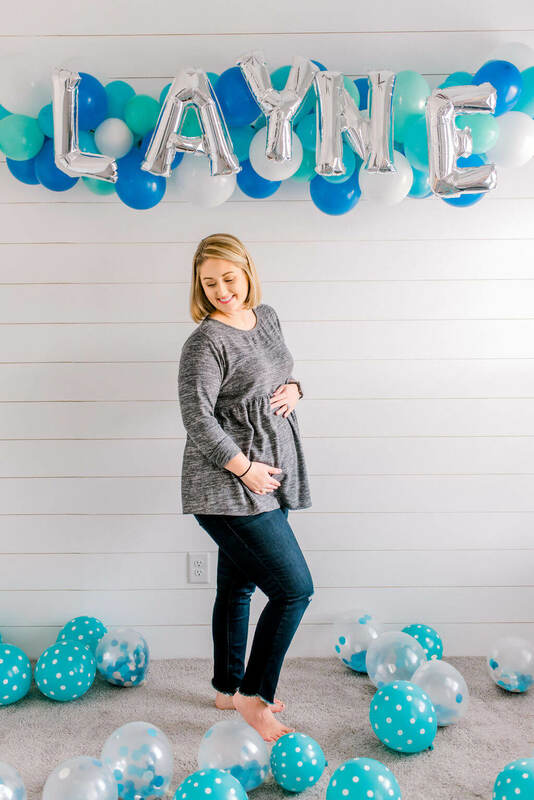 I plan to keep as much as I can a secret for now, but I’ll be doing a whole nursery reveal on the blog at the beginning of June! Stay tuned!